A few years ago I discovered a cupcake that captured every one of my senses and made my cake jackpot lights and bells go nuts. I’m not a generally store-bought cupcake kinda gal but when I walked past a sign saying pistachio and rosewater cupcake, I knew one of those puppies had my name all over it. When it came time to organise my wedding cake I knew this baby was it. The problem was I was getting married 2500 kms away from this shop. I explained my plight, thinking maybe they’d take pity on me and allow their recipe to wing its way to my cake maker in Port Douglas, QLD… alas, they merely shook their heads and said forget about it. They also said that this cake would never withstand being larger than a cupcake as the mixture would cave in. Dastardly bastards. They may as well have challenged me to a sword fight at dusk. I went to my guru of cake. I described this cake to her with words like delicate, exotic and exquisite. She had never heard of such flavours in a cake. There was only one thing for it. Express Post. From the second she received the slightly sweaty, partly mooshed, icing smeared flying cupcake, she was onboard the adventure. She was dissecting it on her tongue, trying to recreate the texture and flavour. She did all that and more. 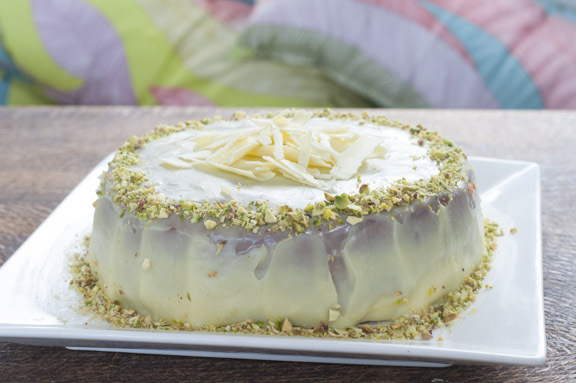 She not only matched the delicate flavours, but she made it better… and then smothered it in white chocolate ganache. 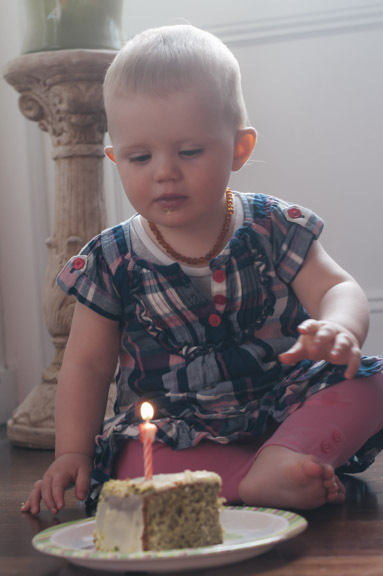 I didn’t throw a kids party for Kiki’s first birthday. I threw a late lunch feast for a few dear ones who love her to pieces. I thought this was the perfect opportunity to recreate our wedding cake. Maybe it’s a little bit weird, but I’ve actually been dying for an excuse to make it. The beauty of it is it’s possibly the easiest cake ever. You make it in a food processor. No creaming, no sifting, no nuffing. You chuck everything in, and whizz. Note : This is to make one 8 inch round cake…. oh, and this batter is so freakin’ yummy, it’s addictive. Preheat oven to 160C. Grease and line a baking tin. Very finely grind your nuts in a food processor. Chuck in your flour, cardamom and sugar and blend to combine. Add the rest of the ingredients and blend until smooth. Chuck your chocolate and cream into a saucepan and melt together. Leave to cool for a good few minutes before you spoon on. Spoon into the middle and gently push it towards the edge until it runs down the side. I then melted my remaining few pieces of chocolate and smeared in onto baking paper before rolling it and setting it in the fridge. When you unfurl it you have curls and cool pieces for garnish. Chuck it on with some pistachios and you have yourself a cake that’s fit for a wedding… or a first birthday. Hooking up with Our Growing Edge. This month’s host is Sonya, at And More Food. Go see who’s tending their growing edge this month! What a great story! 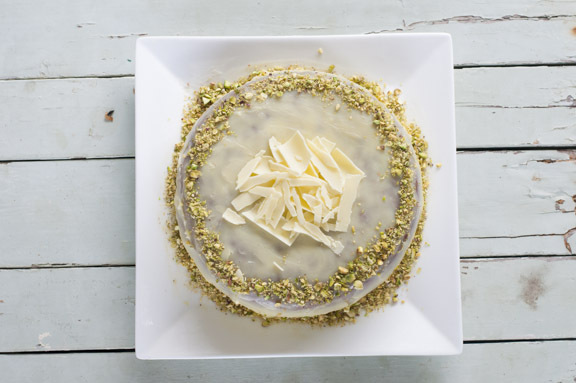 I love pistachios, rose water and white chocolate! All mixed up in a cake sounds divine. I’m defo going to make this. V.
I ate some for breakfast! Mmmm, this really does sound incredible. I love nut cakes and middle eastern flavours too. I’m bookmarking this to make soon. I love the story of this cake too. You’ve pretty much made an epic tradition. It could be your family cake. Love the whole “bung in the food processor” attitude…If only I had one of those magical machines. To be honest, I didn’t know pistachios came pre-shelled. I’d never be able to shell pistachios without eating them. Force of habit. Isn’t it interesting that the time it takes to shell a pistachio is identical to the time it takes to eat one? Once I start eating, it’s difficult to stop because the flow is so very zen. Thanks for submitting this gorgeous cake to Our Growing Edge! Pistachio nuts are addictive!! These are raw and unshelled. TBH they’re easier to resist than roasted and salted. Stunning photo. 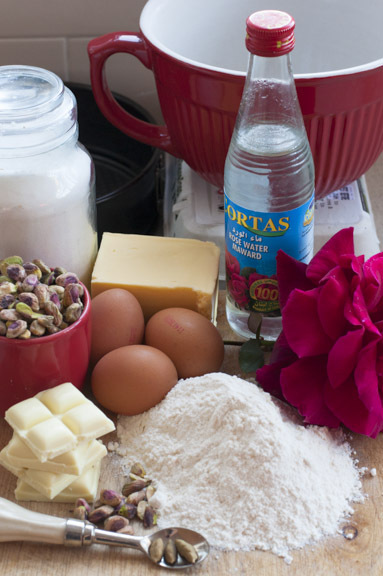 I’ve never made cake so this recipe is definitely one to try. this looks so good. I have a weakness for pistachios, and with chocolate – I’m a goner. Thanks so much….nice wrap up. This cake is my new favorite. If you came to tea, it would surely be on the table. HI, I made the rosewater pistachio cake for my mums 70th Birthday. It was AMAZING! Thanks for an awesome recipe. I’m so thrilled to hear that!! Happy birthday to your mama. Hi, I want to make this cake again but I now follow A grain free diet. Would you know how to adjust the recipe? Im thinking just add an extra 150grams of pistachios in place of SR flour. Should I adjust any other ingredients? Thanks. That’s awesome. It’s a winning recipe!! So pleased you love it. I’n crazy about it.